For this week's Ranked!, we decided to rank our favorite '80s soundtracks. Enjoy! There are few more unlikely chart toppers than "She's Like the Wind," a song, according to all knowing/all seeing Wikipedia, originally written for the movie Grandview, U.S.A.. Remember that little nugget of a film? Me neither. Their loss as the song got picked up by Dirty Dancing and those of us who watched that movie on VHS until the tape finally wore thin or watched MTV obsessively were treated to the silky warblings of Patrick Swayze. May he rest in peace. The soundtrack benefited from the constant rotation of its videos on MTV and VH1. "(I've Had) The Time of My Life" and "She's Like the Wind," as well as "Hungry Eyes" by Eric "All By Myself" Carmen were mainstays of the music video channels in '87/'88, thanks mostly to the handsome mug and naked torso of Swayze. The oh-so-adorable Jennifer Gray sporting her original nose certainly didn't hurt either. The songs were ridiculously catchy, too. 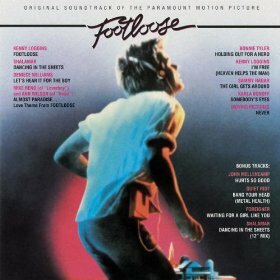 You're probably thinking, "Sure, I played my Footloose cassette to death in Junior High, but why should I replace it now? I rarely 'kick off my Sunday shoes' and 'cut loose' anymore. I'm busy. Plus I've got bad knees." Why? Are you kidding me? 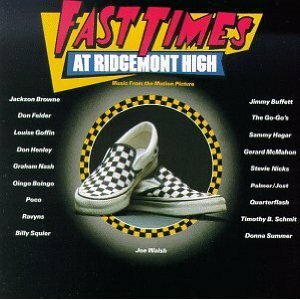 This soundtrack's got a little bit of everything, a perfect blend of buoyant '80s danceability. It offers not only genre-spanning pop ear candy, but the perfect background music for so many everyday situations. Say you're trying to teach your best buddy how to unleash his inner pop-and-lock: Deniece Williams's bubblegum-snappy "Let's Hear it for the Boy" is the perfect accompaniment. Or how about when you find yourself in a game of tractor chicken, barreling down a dusty road towards your opponent at a terrifying, breakneck two miles per hour? You need Bonnie Tyler rasping out the heart-pounding "Holding Out for a Hero" in the background. Sammy Hagar's fast and dirty "The Girl Gets Around" is perfect for when you're this close to getting the local preacher's daughter to jump into your truck. And of course, for those times when you're angry-dancing in an abandoned warehouse (I can't tell you how many times I've been there, man): Moving Pictures' cheese-tastic yet hard driving "Never." If nothing else, there's always our boy Kenny's heel-kicking, raisin'-a-ruckus eponymous song, which still rocks enough to save the lamest of proms, no matter what year it is. It was the summer of '87 and vampires were cool. We're not talking the sparkly, wimpy vampires of today. These vampires hung out on boardwalks, hung from overpasses, drank blood from goblets, and ate maggots. They were dangerous and cool. And so was their music. After seeing the movie, The Lost Boys cassette found its way into my boom box and remained there for a very long time. It became not only my soundtrack to that summer, but for a few summers to follow. 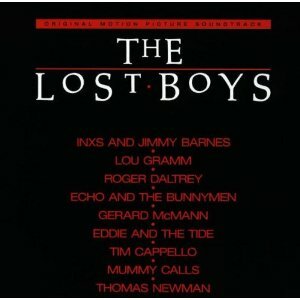 Much like the movie itself, The Lost Boys soundtrack is a study of cool. INXS, at the height of their popularity, contributed two raucous tracks. Roger Daltrey gave a soulful version of the epic "Don't Let the Sun Go Down On Me" and Echo & The Bunnymen sounded like a Doors cover band with their take on "People Are Strange." But the song that will perpetually stand out for me is the moody, haunting "Cry Little Sister," which is the centerpiece of the album. If you want a soundtrack album that embodies the music of the early '80s, look no further than the Valley Girl soundtrack. You had The Plimsouls' "A Million Miles Away," "Who Can It Be Now?" by Men At Work, "Angst In My Pants" by Sparks, "Love My Way" by Psychedelic Furs, and the '80s classic, Modern English's "I Melt With You," a favorite of '80s proms and lovers. But unlike most soundtracks, where producers seek out the most popular artists of that given moment, Valley Girl contains tracks from the "little guys." The Flirts contributed "Jukebox (Don't Put Another Dime)," which I thought was an extremely scandalous tune at the time because I couldn't belive our local video channel would play a song with the word "damn" in the pre-chorus. The horror! And just like The Plimsouls, Josie Cotton not only contributed two tracks to the soundtrack, one being the fantastic "Johnny, Are You Queer?," but also performed in the film. She was the lead singer of the prom band! My prom had some forty-year-old loser spinning Bon Jovi ballads and "Y.M.C.A." The movie and music... and the timing. Imagine an awkward, chubby, just-wanted-a-boy-to-like-her 7th grade girl. 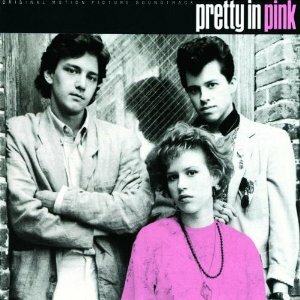 The Pretty In Pink soundtrack was a pivotal force in my young development. I swear I smell Aqua Net whenever "If You Leave" comes on. This music takes me back to the days I'd close my eyes and imagine what it'd be like to have a boy kiss me. I'm sorry. I lost my focus. I've kissed a boy. It's just... how powerful is music? INXS, The Smiths, New Order. How would my adulthood be now without the angst... the dreaming... the pining. And the work -- I would never want a teenhood without having to spend hour after hour hitting rewind on my GE cassette player or Walkman. Much has been said and written about Prince's seminal '80s soundtrack, Purple Rain. So much so that it's nearly impossible to find a new angle to assess or secret to expose that someone hasn't discussed at length. As a matter of fact there was a moment while writing this that I decided that maybe two sentences could sum it up quite nicely: "Ladies and gentlemen, we are gathered here today to listen to the world's most beloved funkadelic masterpiece given to us by the tiny monarch of musical bedlam. Now enjoy." This was Prince at his crossover best, fusing funk, r&b, rock, and dance and creating an intoxicating mixture of hard edges, dance songs, and volatile live performances. That and you know you envied his ability to dance for two hours straight in stilettos and make your mother gasp in horror the first time she heard the lyrics to "Darling Nikki." We showed you ours, not show us yours. What was your favorite '80s soundtrack? Have your say in the comments!